This page provides a comprehensive overview of the divine and mortal children of the god. The majority of these, however, were only linked to him with the briefest of genealogical references. His only significant mortal son was Erikhthonios (Erichthonius), an early king of Athens. EUKLEIA (Eucleia) The goddess of good repute and glory, a daughter of Hephaistos and Aglaia. EUPHEME The goddess of being well-spoken, a daughter of Hephaistos and Aglaia. EUTHENIA The goddess of prosperity and plenty, a daughter of Hephaistos and Aglaia. KABEIROI (Cabeiri) Gods or daimones of the Mysteries of the island of Samothrake (Greek Aegean). They were sons of Hephaistos and the nymph Kabeiro. KABEIRIDES (Cabeirides) Nymphs of the Mysteries of the island of Samothrake (Greek Aegean). They were daughters of Hephaistos and the nymph Kabeiro. PALIKOI (Palici) Gods of the hot-springs and geysers of the region of Palikoi in Sicily (southern Italy). They were sons of Hephaitos and Aitna (or, according to others, of Zeus and Hephaistos' daughter Thaleia). PHILOPHROSYNE The goddess of friendliness and welcome, a daughter of Hephaistos and Aglaia. THALEIA (Thalia) A nymph of the island of Sicily (southern ITaly). She was a daughter of Hephaistos loved by Zeus. ARDALOS (Ardalus) A man of Troizenos in Argolis (southern Greece) who invented the flute. He was a son of Hephaistos. ERIKHTHONIOS or EREKHTHEUS (Erichthonius or Erechtheus) An early king of Attika (southern Greece), son of Hephaistos and Gaia who was born from an attempt by Hephaistos on the virginity of Athena. He was raised by the goddess in her temple on the Akropolis. KAIKALOS (Caecalus) A king of Prainestes (central Italy). He was a son of Hephaistos. KAKOS (Cacus) A barbarous, fire-breathing giant of Latium (central Italy), who was slain by Herakles. He was a son of Hephaistos. KERKYON (Cercyon) A bandit of Eleusis in Attika (southern Greece) who used to wrestle and murder passers-by. He was slain by Theseus. According to some his father was Hephaistos (others say it was Poseidon or a local man Brankhos). OLENOS (Olenus) A king of the town of Olenos in Akhaia (southern Greece) and son of Hephaistos. PALAIMONIOS (Palaemonius) A lord of Olenos in Akhaia (southern Greece) and one of the Argonauts. He was a son of Hephaistos (or alternatively of Lernos or Aitolos). PERIPHETES or KORYNETES (Corynetes) A bandit of Epidauros in the Argolis (southern Greece) who used to club passers-by until slain by Theseus. He was a son of Hephaistos and Antikleia (or, according to others, of Poseidon). PHILAMMON A king and musician of Phokis (central Greece). According to one author he was a son of Hephaistos ( most accounts however make him a son of Apollon). PHILOTTOS A son of Hephaistos. PYLIOS (Pylius) A man of the island of Lemnos (Greek Aegean) who cured the Trojan-War hero Philoktetes of his snake-bite wound. RHADAMANTHYS A judge and lawmaker of the island of Krete (Greek Aegean). According to one author he was a son of Hephaistos (although the usual account makes him a son of Zeus and Europa). SERVIUS TULLIUS A king of Rome and Latium (central Italy). He was a son of Hephaistos (Volcanos) and Ocresia. SPINTHER A son of Hephaistos. "Sons of Vulcanus [Hephaistos]. Philammon. Cecrops. Erichthonius. Corynetes. Cercyon. Philottus. Spinther." Sphinster and Pilottus are not mentioned by any other authors and Hyginus gives no further explanation. LOVED : 1. Aphrodite, goddess of love; 2 - 5. Kharis Aglaia, goddess of beauty. FATHERED : 2. Eukleia, goddess; 3. Eupheme, goddess; 4. Euthenia, goddess; 5. Philophrosyne. LOVED : 1. Athena & Gaia, goddesses; 1. Atthis, princess of Athens. FATHERED : 1. Erikhthonios, king of Athens; 2. Kerkyon, bandit of Eleusis. "Erikhthonios [king of Athens], according to some, was the son of Hephaistos and Kranaus' daughter Atthis, while others say his parents were Hephaistos and Athene, in the following manner [see HephaestusLoves: Athena for this story]." "Kings of the Athenians . . . Erichthonius, son of Vulcanus [Hephaistos]." "Sons of Volcanus [Hephaistos] . . . Cecrops [of Attika]. Erichthonius [of Attika]." 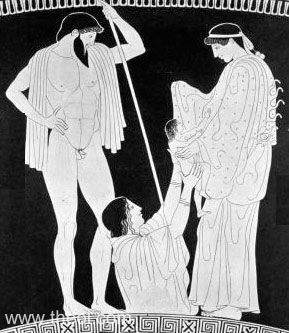 "The infant boy [Erikhthonios], great Volcanus' [Hephaistos'] child, the babe no mother bore." "A rumbling argument arose in heaven, the gods all grumbling why others should not be allowed to grant such gifts [the rejuvenating power of the goddess Hebe] . . . Mulciber [Hephaistos] required new life for [his son] Erichthonius." "Volcanos [Hephaistos] . 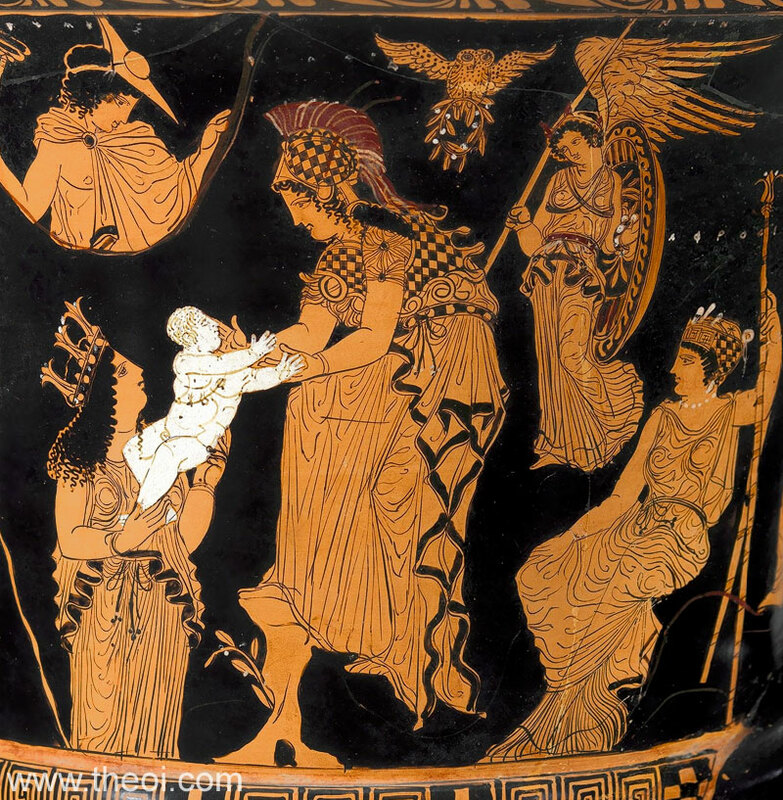 . . was reputedly the father by Minerva [Athena] of the Apollo [Erikhthonios] said by the ancient historians to be the tutelary deity of Athens." "Erikhthonios, the son of Hephaistos and Athena." "[Theseus] killed by force of arms Cercyon, son of Volcanus [Hephaistos]." "Sons of Volcanus [Hephaistos] . . . Cercyon [of Eleusis, Attika]." "Cercyon, son of Vulcanus [Hephaistos]." LOVED : 1. Antikleia, woman of Epidauros. FATHERED : 1. Periphetes, bandit of Epidauros; 2. Ardalos, musician of Troizenos. 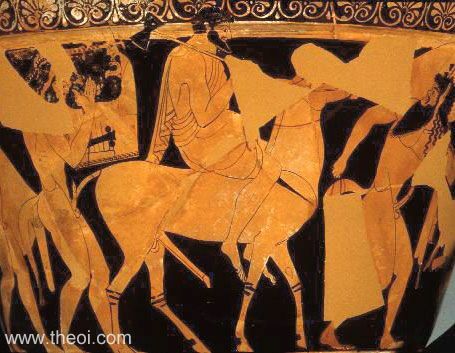 "He [Theseus] cleared the route [from Troizenos to Athens] of criminal types who were occupying it. The first of these was Periphetes, son of Hephaistos and Antikleia, who was nicknamed Korynetes, the Mace-man, from the club he carried. Weak in his underpinnings, he sported an iron club with which he killed people passing by. Theseus killed him at Epidauros." "Sons of Volcanus [Hephaistos] . . . Corynetes [another name for Periphetes]." "[At Troizenos in the Argolis is] a sanctuary of the Mousai (Muses), made, they told me, by Ardalos, son of Hephaistos. This Ardalos they hold to have invented the flute, and after him they name the Mousai Ardalides." FATHERED : 1. Olenos, king of Olenos; 2. Palaimonios, Olenian lord. "A certain Olenus, son of Volcanus [Hephaistos], had two daughters, the Nymphae Aex and Helice, who were nurses of Jove [Zeus]." "[Numbered amongst the Argonauts was:] Palaimon, son of Hephaistos or Aitolos." "At the same time came Palaimonios [to join the Argonauts], who was the son, or rather the reputed son, of Olenian Lernos, his real father having been Hephaistos. This accounted for his being lame." FATHERED : 1. Philammon, king of Phokis. "Sons of Volcanus [Hephaistos]. Philammon [of Phokis]." LOVED : 1 - 2. Kabeiro, sea nymph. FATHERED : 1. Kabeiroi, demi-gods of Samothrake; 2. Kabeirides, nymphs of Samothrake; 3. Pylios, Lemnian lord. "Akusilaüs, the Argive, calls Kadmilos the son of Kabeiro and Hephaistos . . . Pherekydes says that . . . three Kabeiroi and three Nymphai called Kabeirides were the children of Kabeiro, the daughter of Proteus, and Hephaistos, and that sacred rites were instituted in honor of each triad." "From the firepeak rock of Lemnos the two Kabeiroi in arms answered the stormy call beside the mystic torch of Samos [Samothrake], two sons of Hephaistos whom Thrakian Kabeiro had borne to the heavenly smith, Alkon and Eurymedon well skilled at the forge, who bore their mother's tribal name." "[Deriades addresses his Indian troops :] ‘Let Lemnian Kabeiro unveiled lament the death of her two sons [the Kabeiroi]; let sooty Hephaistos throw down his tongs, and see the destroyer of his race sitting in the car of the Kabeiroi.’"
"Two firestrong citizens of Samothrake [the Kabeiroi] . . . sons of Lemnian Kabeiro; their eyes flashed out their own natural sparks, which came from the red smoky flame of their father Hephaistos." "Philoktetes [a hero of the Trojan War], at Lemnos, was cured by Pylios son of Hephaistos, from whom he learned how to draw the bow." FATHERED : 1. Rhadamanthys, lawmaker of Krete. "Kinaithon too in his poem represents Rhadamanthys as the son of Hephaistos, Hephaistos as a son of Talos, and Talos as a son of Kres. The legends of Greece generally have different forms, and this is particularly true of genealogy." LOVED : 1 - 2. Aitna, nymph of Etna. FATHERED : 1. Palikoi, gods of geysers; 2. Thaleia, nymph of Etna. LOVED : 2. Okresia, princess of Rome. FATHERED : 1. Kakos, giant of Latium; 2. Servius Tullius, king of Rome. "This ogre [Kakos], was the son of Volcanos [Hephaistos]; as he moved in titan bulk, he breathed out his father's deadly flame." "Savage Cacus . . . this monster's father was Mulciber [Hephaistos] . . . he resorts unbravely to his father's arts, and retches roaring flame. You would think every blast was Typhoeus' breath, a bolt of lightning hurled from Etna's fire." "Cacus found no defence in his father's [Hephaistos'] gift of flame." "The temple [of Tullius seventh king of Rome] burnt down, but fire spared the statue; Mulciber [Hephaistos] himself assisted his son. For Tullius' father was Volcanus [Hephaistos], his mother lovely Ocresia from Corniculum." FATHERED : 1. Kaikalos, king of Praeneste. "Caeculus . . . the founder of Praeneste, the king who men throughout the ages have believed was the son of Volcanos [Hephaistos], born among flocks and herds, and found on the hearth."